Now my country is under foreign occupation. This colonial subjugation has been going on for more than half a century and Communist China’s systematic propaganda and re-writing of our history has produced a generation of Tibetans who have no concept of their past glories and cultural heritage. 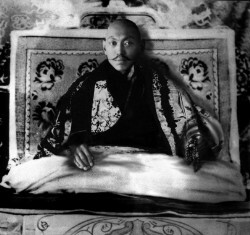 It is hence imperative for you today to reclaim, reassert and reaffirm our history because the power of our past determines our future; the reality of our past gives us the strength, fortitude and vision to achieve a free Tibet where we can rule ourselves in tune with our culture and values. This reclamation of history is a battle of truth against falsehood, memory against censorship, and legitimacy against occupation. In 1933 I stated that we must ‘[m]aintain friendly relations with the two great powers, China and India, conscript able soldiers to guard the borders and make them sufficiently strong to ward off those countries with whom we have had border disputes. The armed forces should be drilled and disciplined so as to be effective and strong to overcome those who threaten us.’ Much water has flowed under time’s bridge since I said these words and the world that I knew has long since disappeared. Old boundaries have been erased and new ones drawn. Consequently, we need to not only obsessively invest in education and accumulate knowledge but also develop tactical wisdom to translate our vast global goodwill into concrete political support. China is no longer the weak and strife-torn country of a century ago: it has metamorphosed into an economically strong nation that thuggishly flexes its muscles at anyone and any country that dares to speak or openly support us Tibetans. This harsh reality calls for fresh ideas, better strategies and long-term vision. We must build new forces such as concerted multi-lateral actions and strategic non-violent campaigns. We must cease to beg with folded hands at the earless walls of the United Nations and start to take our struggle to the next level with self-assuredness and inner strength. The People’s Republic of China may have the largest cash reserve in the world but it is a giant balloon with millions of needles piercing from within. Its leaders are blinkered, its system corrupt and its future uncertain. Nevertheless, the Communist Party’s stranglehold over Tibet continues. Our beloved country is passing through a long and dark night and my people are immersed in immense suffering. The socialist hell imposed by Mao Zedong and his successors has brought a life-and-death struggle to Tibet and its people, driving many of them to set themselves on fire as a last, non-violent, resort to express their dissent. There is no pain deeper and no sacrifice greater than a seventeen-year-old nun dousing herself in petrol and turning into a fiery ball of protest while calling for Tibet’s independence. Without bitterness, animosity and hatred towards her oppressors, this teenage nun’s motivation is the highest level of bodhicitta. Looking at the sheer selflessness, loyalty and courage of such young people, there is great hope for the future. But the task at hand is not easy and the road ahead will be long. The sacrifice and dedication of our brothers and sisters in the Land of Snow have set a new standard in our struggle. Now it is the responsibility of those living in relative freedom in exile to match and surpass this level of commitment and devotion to our fight for independence. I know that with your linguistic skills and creativity, access to the global leaders, information and the news media, you are uniquely positioned to fulfil this historic duty. However, over the past few years I have noticed that some of you, who are highly educated and articulate, have been using your precious time and intelligence to point fingers at each other. Moreover, sadly, some of our rangzen warriors, who may not even have seen the corridors of our government-in-exile, are loudly shouting against it. Democracy can be frenzied and complicated, especially our tsen-jol bod-shung, which functions under the auspices and goodwill of its host country. Our government may not be operating as efficiently as you would wish and you may not agree with some of its policies. But just as you have one biological mother and father, you have only one legitimate government that represents our people living on both sides of the Himalayas. No other institution can replace this. If you took the trouble to find out, there are democratic channels through which you can air and register your disagreements – rationally, maturely and transparently. There is no need to hide behind a veil of social networks to motormouth your personal frustrations. A couple of rangzen advocates may have strong extremist leanings. Fanaticism, we all know, is the last refuge of cowards. Others, while criticising bod-shung, have gone to the extreme of comparing our democratic government with despotic one-party-ruled China. Please be extremely careful with your click-happy fingers and acidic comments. Rot comes in small doses and sometimes without clear intent. Our struggle for freedom is not a long-distance shouting match. It is nothing less than a revolution against tyranny. Revolution is a strategic vision backed up by a systematic campaign. Revolution is the might of a pen matched by the strength of action. Revolution is a mission leading to independence. It is the willingness to sacrifice everything and to march forward with hope grounded in reality. Revolution rejects submission to suppression. Our revolution is an act of resistance which fundamentally challenges China’s occupation of our homeland and, in the process, kindles our collective consciousness to coalesce ourselves into a single fabric called ‘Tibet’. This revolution is not about who can point a finger at whom the fastest. Nor it is a contest to see who can use more invectives against our people by calling them ‘spineless’, ‘incompetent’ and branding our exile government as ‘self-serving’. If rangzen is to have any resonance with our people and if our struggle is to succeed, hurling tirades is not the right approach. You should not bombard others with your own inadequacies and failures. ‘It is those who know how to rebel, at the appropriate moment, against history who really advance its interests,’ wrote Albert Camus. And yet some of our fervent rangzenpas don’t even seem to know who to rebel against. Knowledge without understanding of wider historical and geopolitical perspectives has very little value. Information without practical application has no meaning. Passion without a purpose is pointless. This is why sometimes I feel that some of you have mouths that cover the entirety of your heads, and your heads are bigger than your bodies. A few of you have this habit to hang around only with your tiny circle of ‘like-minded’ people. The battle to make rangzen a national policy must involve all of our people, more so those who have differing political orientations. More importantly, it involves lobbying our parliamentarians to reflect people’s aspirations. Independence for the Snowland cannot be achieved only with tiny exclusive meets in far-away places over coffees and wafers. Revolution must begin with awakening the masses. ‘Involve me and I will understand’ goes an ancient proverb. More than any time in our long history, and more than any other moment in our recent past, there is an urgent need now to bring all tsampa-eaters together to push for a singular collective goal of a free Tibet. This requires charisma, leadership and vision. Where is our new Songtsen Gampo? Where is our new Milarepa? Where is Gesar? Where is Yonripon? My brethrens, search the deepest recesses of your minds, explore the tiniest corners of your hearts and hunt the most tortuous labyrinths of your memories, because the seed that can grow into a tree of leadership is within each of you. Keep in mind that you live to witness the ray of freedom rise and not to observe the shadow of repression swell. Remember, I experienced exile too, and I know how desolate it feels to return to your cold rented houses each night. I also know how our people live in our homeland under occupation each day like sheep tethered in a slaughterhouse. In a letter dated 26 August 2012, one of our brothers in the Land of Snow wrote, ‘Tibetans in exile must have the courage to aim all your strength at a single goal. This is our expectation. The life of our nation and its freedom are directly and deeply intertwined with, and depending, on you all.’ The way forward is thus to unite and rise up. I am writing these words from the depth of my heart because I care too much for our struggle to adopt a convenient and easy way to please you. Now each of you must find the right path, fortified by foresight. After all, as a popular adage goes, we are limited not by our abilities but by our vision. Thank you Buchung. I am heartened by your wise and cautionary words. You have taken to task those that would rip holes in the already fragile fabric of Tibetan unity!